Make sure the Conjugated Linoleic Acid (CLA) supplement you take passed our tests and is right for you! 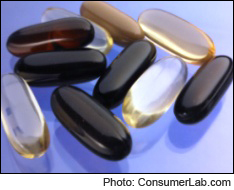 Conjugated linoleic acid (CLA) supplements may help with slimming by increasing the ratio of muscle to fat. However, not every brand of CLA supplement delivers the amount of CLA you expect from the label. In fact, in our most recent tests, only 38.5% of the listed CLA ingredient in one product was actual CLA. Another product provided only 85.8% of the listed CLA. CLA is an expensive ingredient, so you don't want to be shortchanged. You also don't want to spend more than you need to, and we identified one top-quality CLA supplement that cost just one-third as much as some other high-quality products. If you are going to use CLA, you may as well use the best CLA at the best price. You must join to get the full test results for CLA supplements along with ConsumerLab.com's recommendations. You will get quality ratings for eight CLA supplements selected by ConsumerLab.com and for three others that passed our voluntary, quality certification testing.